Though humans might not be as fierce as a lion or white shark, we’re definitely the greatest predatory species in the world, ever. The extent of humanity’s super-predation was assessed by a team at University of Victoria in British Columbia which compared our hunting abilities to those of both land and marine predators in all the oceans and continents, besides Antarctica. 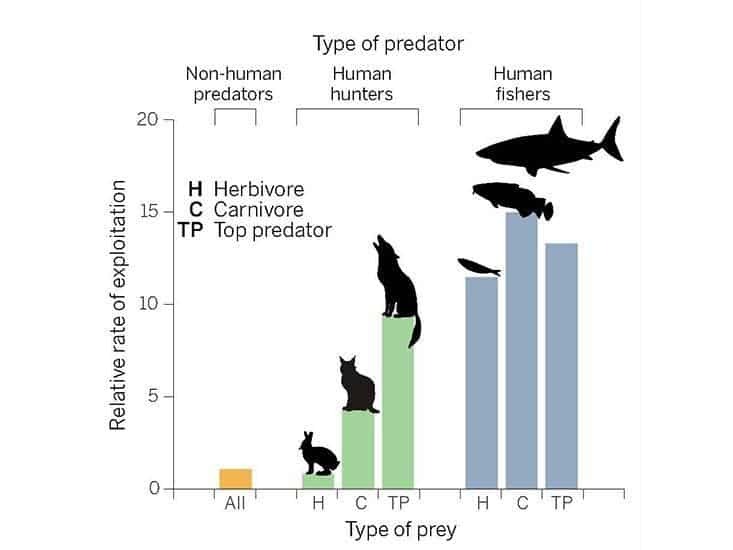 The findings reveal humans lack any real competition preying on adults of other species at rates up to 14 times higher than other predators, especially marine ones. Starting with the 1970s, Thomas Reimchen noticed some disturbing patterns while studying predator-prey relationships in the Haida Gwaii, an archipelago on the North Coast of British Columbia. In this particular ecosystem, 22 species of trout, loons and other predators fed on stickleback fish. He found that the ecosystem was at balance with stickleback numbers remaining fairly constant despite the large number of competing predators who collectively didn’t prey on more than 5% of the adult fish population. In contrast, human fishing in nearby marine waters seized “40 to 80 percent of the biomass of salmon and herring, and then predominantly the reproductive-age classes,” Reimchen found. predators other than human target juveniles. This allows more adults to breed and increases the chance that they lay their eggs. human hunting, especially fishing activities, mainly target adults since these contain more meat. Juveniles are generally avoided since it’s more important for them to grow into adulthood when they become a better catch, but also have the chance to reproduce. This isn’t always true, especially for fish. Heavily targeting adults causes widespread consequences like changing mating patterns and even the biology of fish. For instance, Cod starts breeding when its six years old. In area where over-fishing is cornering Cod, the fish start breeding at four and half years of age, but they also produce fewer offspring. on land, humans kill as much adult prey – mainly herbivores – as non-human predators. in the water, this ratio is heavily skewed in the humans’ favor. Marine predators eat as much as 1 percent of the adult biomass each year. Humans, on the other hand, take a median of 14%. In some cases, this was found to be 80%. the over-predation effect was most felt in the Atlantic Ocean. This can be attributed to the long history of fishing in the area and the ever higher population density. Advanced hunting tools and, in the case of fishing, massive industrialization allows just a handful of individuals to secure food for thousands. In fact, this may very well be the main factor that leads to over-predation: that all people enjoy the spoils of predation even though only a small fraction of the population actually does the hunting or fishing. “If future generations of people are to see large carnivores, then this requires cultivating new tolerance for living with them. This might include increasing revenues to local communities derived from nonconsumptive ‘uses,’ such as eco-tourism [and] shooting carnivores with cameras, not guns,” Darimont told Smithsonian. Now, if humans were to be dependent on this prey which we hunt, then we’d see our numbers stabilize at the same time. But humans also practice agriculture, which basically has had us “set for life”, offering a constant and predictable stream of food. This combination means that humans can hunt entire species to extinction without necessarily driving their own demise, since they always have veggies or grain to makeup for any shortage in meat. 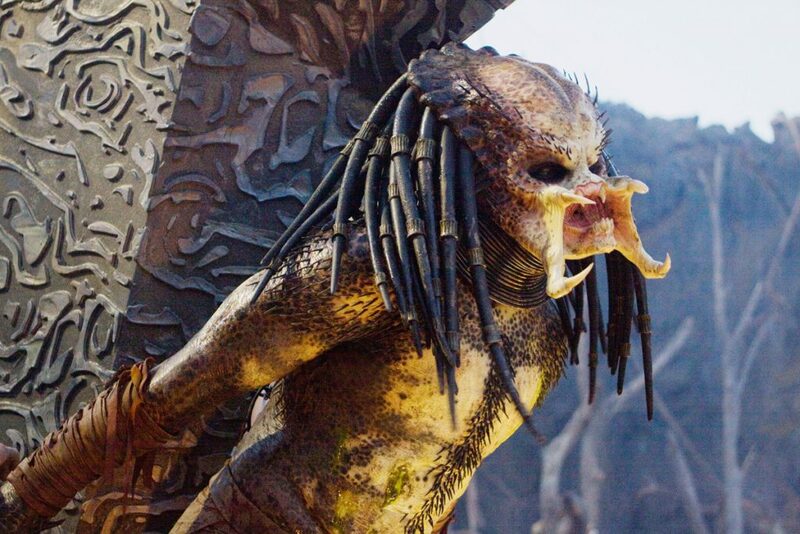 As you might notice, being a super-predator isn’t a good thing and as the world grows – in needs and numbers – it’s becoming increasingly clear that we should move to a more sustainable predation pattern.